← The police came over last night. “Cincai” in English means ‘the work that has been given is done casually with no effort put into it’. So, when other Malaysians call us Sabahans and East Malaysians “Cincai” they are saying that we do not put any effort in our endeavors, we do not strive to be the best, we are not the best, we are ignorant, illiterate and lazy people from the rural areas. So why waste the country’s effort and resources into helping them grow into a prosperous state? You wanna know why? Because you are wrong fool. We are all Malaysians and regardless of the distance and geography of the land that separates us from the west side of Malaysia. We have the same rights to facilities and support that is suppose to be available to ALL Malaysians. The fact that we have an abundant amount of natural resources, friendly and racially blind people makes us even more valuable in today’s society. Sabah could be the hope of the country. The state of Sabah might be the key in uniting this fractured place we call Malaysia. It may not be a perfect place but that doesn’t stop us from trying to live peacefully and respecting each others religion, race and culture. Let it be known that an abundance of natural resources are not what makes a country ‘rich’. A country’s treasure is its people, culture, heritage and history.If a country can take care of its heritage, celebrate it and proclaim it proudly then that country is rich. It is a treasure that every country has. It is a treasure that some have fought hard to preserve and protect while others have let it gone to rot. For now, all I can say is that I am proud to be a Sabahan. What started this blog post is the photo below (don’t worry I have added translations for you below if you don’t understand Malay) I felt sad that my fellow Sabahans had the need to showcase our state to tell everyone that we should be proud to have Sabah in Malaysia and to not underestimate the people in it. 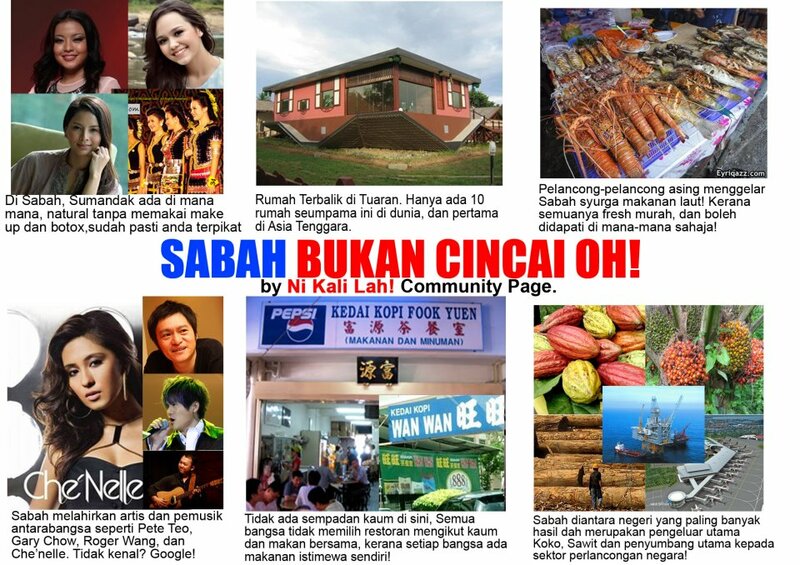 SABAH IS NOT CINCAI, OH! Photo 1: In sabah, beautiful girls are everywhere, looking natural without makeup and botox, You will definitely get hooked. Photo 2: The upside down house in Tuaran. There are only 10 of it’s kind in the world and the only one in South East Asia. Photo 4: Sabah is home to some famous international artist and musicians such as Pete Teo, Gary Chow, Roger Wang and Che’nelle, Don’t know them? Google! Photo 5: There are no segregrations of race here. No one in Sabah chooses a restaurant based on race and eats together because every race has their own special cuisine that can be enjoyed by all! Photo 6: Sabah is one of the states that churns out alot profit for the country and is the number one exporter for Cacao, Palm oil etc. Sabah is a large contributor to the country’s economy via the tourism sector. budu kan? why give them haters the attention they dont deserve? Not all of the Peninsular M’sian are illiterate. Those who mock and made fun of us and our home land only know how to talk rubbish and expect us to leave the rubbish and walk away. They don’t understand why our Sabah and Sarawak have more trees than they have and why we are willing to preserve and re-planting than cutting them down. They don’t understand why we have slow development rate than they are. They thought that our people who are considered ‘miskin tegar’ by the government are always hungry – heck! those yg kena consider miskin tegar tu hari2 berusah-payah membanting di sawah, putung getah, collect buah kelapa sawit, tanam sayur kubis and then still can aramaiitii hari2 without concern of of the term ‘bulan tua’. Of course they don’t work in office with aircon and no monthly pay or get payslip. But they are richer than us yg kerja susah payah d office. Because they don’t have hutang. Can you imagine buying a car, build/buy your house or kawin without loan from bank? We might be cincai in their eyes, but we are certainly not mindless like those haters. But in the end, those haters cuma brani dalam Facebook and Twitter. Dorang lupa, both Sabahans and Sarawakians are descendant of Headhunters & poisonous Sumpitan. butul tu, strong statements and valid points, I wouldn’t call them haters la I think they are more ignorant then anything else. Plus fear of the unknown usually breeds contempt urang bilang. I’ve heard a lot about what Peninsular people said about Sabahans and most of them quite negative or not true, you know what I mean. Something like some of them don’t even know Sabah is a part of Malaysia. At first, I thought my friends were only exaggerating when they told me what semenanjung people said to them. But after I experienced some funny moments first hand, then only I know. 1 guy asked me do we have any shopping malls and another one asked me how’s Malaysia. And now, with all this social networks, we can see how many of them think -ve about us Sabahans. Ok I think this is enough. I’m not sorry for the long post. But here’s a potato anyway. SO far, I have not yet experience this sort of treatment from west Malaysians but I do get the odd joke about elevators and trees (old skool). I have been told that I speak funny but they don’t make fun of it. I don’t think anyone who butchers and mixes malay and English together should talk to much about other peoples accent, right? Ya, its time we promoted domestic travel and get more Malaysians to travel within in Malaysia and get to know their country and its people. Possible bah tu.